Human sacrifice (rensheng 人牲) and the custom to have deceased leaders accompanied (renxun 人殉) by consorts or servants into the netherworld were widespread during the Shang period 商 (17th-11th cent. BCE). The tombs of kings and nobles were furnished not only with weapons and chariots (see Shang military) and items needed in daily life or ritual objects like bronze vessels, but also with humans. The oldest traces of human sacrifice can be found in tombs of the early bronze-age Qijia Culture 齊家文化 (2200-1600 BCE) in Gansu (sites of Huang Niangniang Tai 皇娘娘臺 in Wuwei 武威 and Qinweijia 秦魏家 in Yongjing 永靖). Scattered parts of human skeletons were also found in sites of the Longshan Culture 龍山文化 (3200-1850 BCE), in Jiangou 澗溝 (Dandan 邯鄲, Hebei), Wangwan 王灣 (Luoyang 洛陽, Henan), and Keshengzhuang 客省莊 (Fengxi 灃西, Shanxi). The custom continued into the Western Zhou 西周 (11th cent.-770 BCE) and even the Spring and Autumn period 春秋 (770-5th cent. BCE), but accompanying humans (renxun) were by and by replaced by figurines (yong 俑). Among such figurines, the most famous are those of the underground army (bingmayong 兵馬俑) of the First Emperor of Qin 秦始皇帝 (r. 246-210 BCE). Yet for this burial, humans were killed, also. Some of the Zhou period regional states promulgated laws prohibiting the custom of human sacrifice. The custom of accompanying humans was revived during the early Ming period 明 (1368-1644), when it was decided for the burials of four emperors to have their tombs equipped by a dozen or several dozen of spouses and concubines (feibin 妃嬪). The Qing dynasty 清 (1644-1911) again forbade the custom of accompanying dead – even if the early Manchu rulers had made use of it. In 1673, Zhu Fei 朱斐 submitted a memorial to the Kangxi Emperor 康熙 (r. 1661-1722) asking to prohibit the custom. Henceforth, it was not allowed that Manchu concubines, bondservants (booyi) or slaves followed their master into death. Among the non-Chinese tribes, the custom of accompanying dead was widespread. It is known that the Xiongnu 匈奴, Fuyu 夫余, Tibetans, Jurchens and Mongols believed in the usefulness of subordinates following their master into death. Single person as a netherworld servant, tomb M16 from Hougang 後岡, Anyang. The coffin with the body of the tomb owner, laid into a pit (coffin chamber, guanshi 棺室) in the middle, has decayed, but the accompanying servant, laying on a higher level (ercengtai 二層臺, see profile to the right), is remaining, barring one of his legs. The tomb is furnished with bronze dagger-axes (1, 3), mineral adornments (2), a conch (4), and pottery (5). The small "waist pit" (yaokeng 腰坑) is empty. Source: Zhongguo kexueyuan kaogu yanjiusuo Anyang fajuedui 1972: 19. The number of human sacrifice in Shang period tombs was modest in the early phase (like in Erlitou 二里頭 near Anshi 偃師, Henan, or Erligang 二里崗, Zhengzhou 鄭州, Henan) and reached a peak during the reign of King Pan Geng 盤庚 (around 1300 BCE) in the royal metropolis of Yin 殷 (Anyang 安陽, Henan), before it declined again somewhat. The late Erligang-phase tomb no. 3 of Baijiazhuang 白家莊 includes one victim. Other single human immolations were delivered for the tombs in Liulige 琉璃閣 and Xitai 臺西 (Huixian 輝縣), and tomb no. 2 of Lijiazui 李家嘴 (Panlongcheng 盤龍城). Oracle bone inscriptions reveal that during the reign of King Wu Ding 武丁 (r. 1238-1180 BCE), at least 9,000 persons were killed for sacrifice. The total number of humans sacrified recorded in oracle bone inscriptions runs up to more than 13,000. The highest number recorded for a single instance was 500 (Huang 1992, Yang 1986 says, 300). During the very last phase of the Shang period, only a number of 100 persons is recorded in inscriptions (Yang 1986). The trend in these records can be attested by archaeological findings. 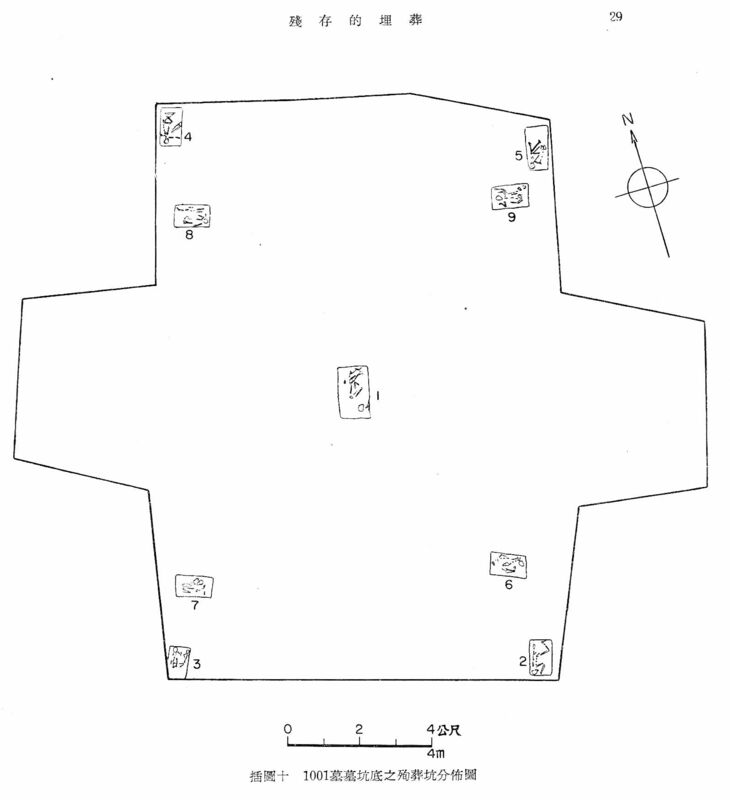 Tombs of the early Shang phase in Erligang (for which no written records exist) only include up to a dozen skeletons. In the high phase of the Anyang period, human sacrifice was brought even for mid-size tombs. 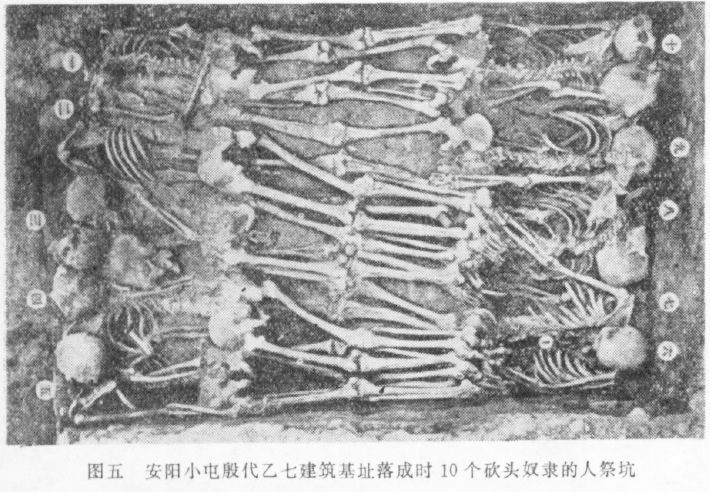 The excavation of the tomb M1400 of Xibeigang 西北岡 and its surroundings brought to light no less than 2,000 skeletons (Huang 1992). The pits of the early phase, arranged in north-south direction, include nearly 1,000 victims, while that of the late phase, aligned east-west, include but about 100 persons (Yang 1986). Another important site for such findings is Houjiazhuang 侯家莊 close to Anyang. Tomb M1001 includes 23 victims in the tomb chamber itself, 61 in side-pits and on the ends of the southern and eastern ramps (mudao 墓道), laid down in rows. 73 skulls are laid down in rows on the distal parts of the four ramps. In the direct surroundings of the tomb, there are 22 side-graves (peizangkeng 陪葬坑) filled with human victims, one to seven per pit, with a total number of 68 persons. Some of these fellows accompanying the king to the neither world were apparently of high standing, as they were buried in coffins, equipped with furnishings of bronze tools and weapons, and were even convoyed by their own servants. Of all the 91 humans found in tomb M1001, 61 were beheaded, but 73 separate skulls were found. 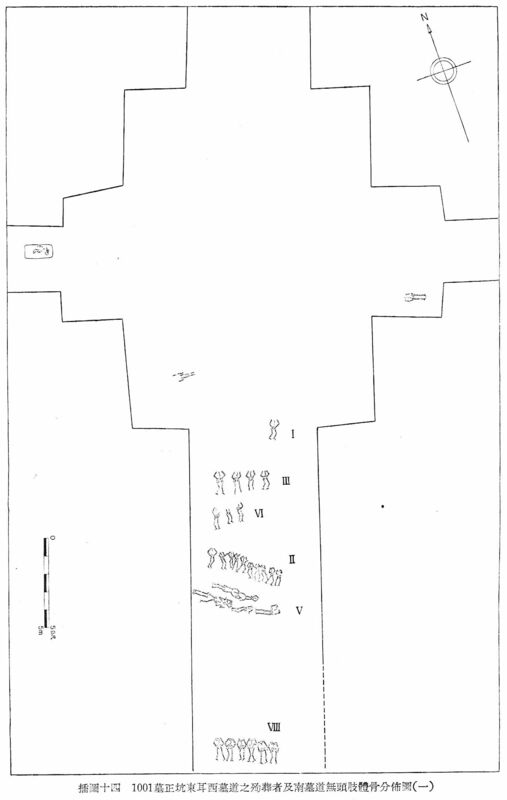 Positions of human offerings inside the large tomb M1001 of Houjiazhuang 侯家莊, Anyang, from Guo (1962). The left image shows the very bottom of the tomb shaft (depth c. 10m), with victims deposited in small pits in the corners, and one in the centre (the so-called yaokeng 腰坑 pit), just below the tomb owner's coffin. 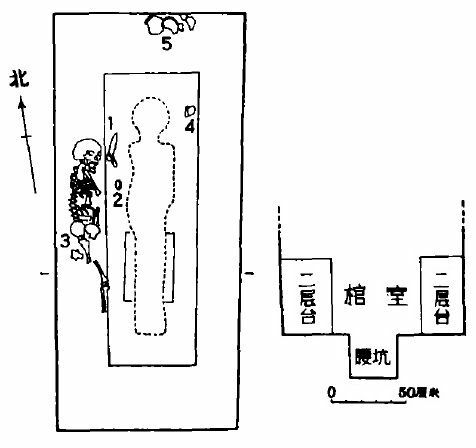 The right drawing demonstrates how different groups of beheaded victims were laid down on the southern ramp. They were lying in two layers, the image shows only one. The skulls of these persons were laid down on yet different layers. Click to enlarge. In the great tomb of Wuguancun 武官村, Anyang, there is a so-called "waist pit" (yaokeng 腰坑) located just under the original position of the tomb owner's coffin (under his "waist"). The pit included one victim with a dagger-axe (see Shang military) – apparently a bodyguard. The level around the tomb chamber (ercengtai 二層臺) enclosed 41 human offerings, some of them buried in a coffin (traces of wood are still visible, even if the wood itself decayed) and furnished with bronze tools, jade, and jewelery. On the northern and southern ramps, the excavators found the skeletons of a few squatting or kneeling persons (fushen zang 俯身葬 "upright burial"). Besides the 45 humans buried on the ramps, there were also horses and dogs. Moreover, there were skulls buried in three levels above the tomb chamber. The tomb M701 of the Xiqu 西區 area in Anyang includes only 12 human offerings. This shows that the size of tombs and the number of human sacrifices directly corresponded, and reflected the status of the tomb owner. Among the victims of human sacrifice during the Shang period were wives and concubines and personal servants or guards of a lord. These were called renxun 人殉, i.e. persons close to a lord who had to follow him into the neither world. Apart from them, slaves or bondservants were virtually sacrified (renji 人祭), mainly war captives like the Qiangfang 羌方 people during the time of King Wu Ding. It was custom to bury them in the same pits like cows, sheeps or pigs, constituting a group of sacrificial beings (xisheng 犧牲 – a word which today refers to a victim or a "martyr"). Human sacrifice (actually, the "slaughtering" of them) was often carried out during the burying process in the vicinity of the tomb on a special offering place (jisichang 祭祀場). Such human sacrifices were, as the inscriptions say, sometimes offered to deities, like Heaven, the Earth, ghosts (called yinsi 淫祀 "offerings to [creatures of the] darkness"), river deities (see He Bo 河伯), or ancestors (di 帝). They were often beheaded (fa 伐) or hacked into pieces (duosui 剁碎), but sometimes burnt (liao 燎) or buried alive. Human sacrifice was also applied for the consecration of royal buildings like palaces or temples. Remains of such immolations were found in so-called "ash or rubbish pits" (huikeng 灰坑) or in ditches at the side or within the stamped-earth terraces (hangtutai 夯土臺) of buildings like Gaochengtai 藁城臺 (Taixicun 臺西村) in Hebei. In the ruins of Palace no. 7 of the B group (short Yi-qi jizhi 乙七基址) in Xiaotun 小屯 (part of the Anyang site), 585 victims were discovered (Huang 1992). While some scholars believe that these offerings were made for the consecration of the building, others hold that the building no. 7 was a kind of temple in which regularly human immolations were brought to ancestral deities and then buried in sacrificial pits (jisikeng 祭祀坑). Pit with human sacrifice from building no. 7 of the B group of remains (yi zu qi jianzhu 乙組七建築) of Xiaotun 小屯, Anyang. The ten victims were beheaded, but the skulls are laid in more or less appropriate position. The men were killed and placed in the pit when the temple was finished (during the completion ceremony, luocheng yishi 落成儀式). Source: Hu 1974: 84. Similar situations were discovered in Hougang 後岡, Nandi 南地, and Dasikongcun 大司空村 (all around Anyang). In the last place, for instance, a ditch revealed 31 skulls and 26 skeletons without head. Some of then were small children. In archaeological sites of the Shang period, more than 6,000 victims were excavated up to now. Human sacrifice after the Shang period is also recorded in historiographical sources. The books Shiji 史記 and Zuozhuan 左傳 report from sacrifices after the conquest of the Shang by King Wu 周武王 of the Zhou, the statelet of Ju 莒 by Ji Pingzi 季平子 (d. 505 BCE) of Lu 魯, the statelet of Zeng 鄫 by Duke Wen 鄭文公 (r. 672-628) of Zheng 鄭, or of Cai 蔡 by Prince Qiji 公子棄疾 from Chu 楚. Numbers of between just a few and 177 persons were offered during the burials of many Spring and Autumn period lords, and are recorded for the dukes Wu 秦武公 (r. 697-678) and Mu 秦穆公 (r. 659-621) of Qin 秦, Huan 齊桓公 (r. 685-643) of Qi 齊, Wen 宋文公 (r. 610-589) of Song 宋, Jing 晉景公 (r. 600-581) of Jin 晉, Zhuang of Zhu 邾莊公 (d. 507) and King Ling 楚靈王 (r. 541-529) of Chu. Archaeologists have discovered more than 80 burial sites of the Zhou period, with a total number of more than 200 human victims, many of them young females or children, and some of them buried in a wooden coffin and accompanied by tomb furnishings. Bagley, Robert (1999). "Shang Archaeology", in Michael Loewe, Edward L. Shaughnessy, ed. The Cambridge History of Ancient China: From the Origins of Civilization to 221 B.C. (Cambridge: Cambridge University Press), 124-231. Chang, Kwang-Chih (1980). Shang Civilization (New Haven: Yale University Press). Hu Houxuan 胡厚宣 (1974). "Zhongguo nuli shehui de renxun he renji 中國奴隸社會的人殉和人祭", Wenwu 文物, 1974/7: 74-84; 1974/8: 56-72. Huang Zhanyue 黃展岳 (1983). "Yin-Shang muzhang zhong renxun rensheng de zai kaocha, fu lun xunsheng jisheng 殷商墓葬中人殉人牲的再考察--附論殉牲祭牲", Kaogu 考古, 1983/10: 935-949. Huang Zhanyue 黃展岳 (1986). "Renxun renji 人殉人祭", in Zhongguo da baike quanshu 中國大百科全書, Kaoguxue 考古學 (Beijing/Shanghai: Zhongguo da baike quanshu chubanshe), 410. Huang Zhanyue 黃展岳 (1990). Zhongguo gudai de rensheng renxun 中國古代的人牲人殉 (Beijing: Wenhua chubanshe). Huang Zhanyue 黃展岳 (1992). "Renxun renji 人殉人祭", in Zhongguo da baike quanshu 中國大百科全書, 中國歷史 (Beijing/Shanghai: Zhongguo da baike quanshu chubanshe), Vol. 2, 855. Huang Zhanyue 黃展岳 (2004). Gudai rensheng renxun tonglun 古代人牲人殉通論 (Beijing : Renwen chubanshe). Luo Kun 羅錕 (1982). "Shangdai renji ji xiangguan wenti 商代人祭及相關問題", in Hu Houxuan 胡厚宣, ed. Jiagu tanshilu 甲骨探史錄 (Beijing: Sanlian shudian), 112-191. Ma Dezhi 馬得志, Zhou Yongzhen 周永珍 (1956). "Women dui Yindai fushen zang de kanfa 我們對殷代俯身葬的看法", Kaogu tongxun 考古通訊, 1956/6: 88-90. Meng Xianwu 孟憲武 (1992). "Tan Yinxu fushen zang 談殷墟俯身葬", Zhongyuan wenwu 中原文物, 1992/3: 52-55. Shelach, Gideon (1996). "The Qiang and the Question of Human Sacrifice in the Late Shang Period", Asian Perspectives, 35/1: 1-26. Xu Yu 許鈺, ed. (1992). Zhonghua fengsu xiao baike 中華風俗小百科 (Tianjin: Tianjin renmin chubanshe), 1. Yang Xizhang 楊錫璋, Yang Baocheng 楊寶成 (1977). "Cong Shangdai jisi keng kann Shangdai nuli shehui de rensheng 從商代祭祀坑看商代奴隸社會的人牲", Kaogu 考古, 1977/1: 13-19. Yang, Xizhang 楊錫璋 (1983). "Shangdai de mudi zhidu 商代的墓地制度", Kaogu 考古, 1983/10: 929-934. Yang Xizhang 楊錫璋 (1986). "Shangdai de renxun he rensheng 商代的人殉和人牲", in Zhongguo da baike quanshu 中國大百科全書, Kaoguxue 考古學 (Beijing/Shanghai: Zhongguo da baike quanshu chubanshe), 438. Zhang Mingdong 張明東 (2011). "Lüelun Shang-Zhou fushen zang ji qi xiangguan wenti 略論商周俯身葬及其相關問題", Zhongguo guojia bowuguan guankan 中國國家博物館館刊, 2011/3: 116-122. Zhao Guangxian 趙光賢 (1956). "Guanyu Yindai fushen zang wenti de yidian yijian", Kaogu tongxun 考古通訊, 1956/6: 85-88. Zhongguo kexueyuan kaogu yanjiusuo Anyang fajuedui 中國科學院考古研究所安陽發掘隊 (1972). "1971 nian Anyang Hougang fajue jianbao １９７１年安陽后岡發掘簡報", Kaogu 考古, 1972/3: 14-25.